When you learn to create a sales funnel, you’re better able to generate the types of content that speaks to potential customers at all stages of the buyer’s journey. In the beginning, it’s important to realize that sales funnels aren’t watertight. They have multiple entry and exit points, and not all visitors start at the top. They may have completed research elsewhere, for instance, and already know what they want. Even those customers, however, need convincing they should buy from you and not your competitor. Exactly what you choose will depend on your specific homebuilder business, and for that reason not all sales funnels look identical. Right at the top of the funnel, at this stage people are still identifying their problem. They’re not sure what they want or what’s available, so they’re casting their net wide. Your job is to create materials that help them put a label on a problem, so they can then move towards finding a solution. At the very top of your sales funnel are your landing pages and informational posts such as infographics. These visitors make up the bulk of unqualified leads; they don’t know you yet so they’re not ready for a sales message. People at the education stage have identified their problem and want to know how to solve it. They’re looking for information that helps them quantify just how much of a problem it is, and this could include finding out how long it takes to complete a project, how much it might cost, and if it suits their lifestyle or aspirations. They’re not yet qualified leads, but they are prospects. You could include eBooks, floor plans, décor examples, virtual tours, local neighborhood news or anything else that will excite people who’re learning about the building process as it applies directly to them. At the education and engagement stages, potential customers want to know a bit more about you, but they may not want to be too open about their interest just yet. They’ll sign up to your newsletter or download other gated material, they’ll peek at your Facebook or Twitter and maybe follow or like. Your job here is to carry on providing solid and useful information through your social media marketing so you build trust, show your human, approachable side, and demonstrate an understanding of their needs. Once you’ve nurtured your casual website visitors this far along your sales funnel, they’re more or less ready to make the purchase. You’ve been there at every step of the journey, with non-salesy advice that’s helped them reach an informed decision. They trust your expertise and like that you give so much useful information up front. They’ve learned from you and read testimonials from other happy customers. If they’re going to buy from anyone, it’ll be you, and they’ll maybe even tell their friends about you. They’ll continue to engage through social media and receive your email newsletter, and will appreciate special offers or discounts that rewards their custom. Just because they’ve become customers doesn’t mean you can neglect them. 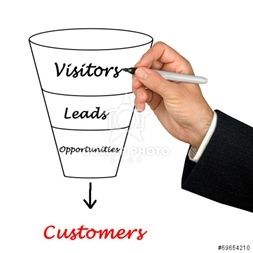 New leads are important, but with proper attention your sales funnel becomes a repeatable journey that will tempt current customers to also become future ones.